I hope you all had a good Easter! (Or just a relaxing Sunday, if you're not the Easter sort. Good excuse to eat chocolate, either way.) 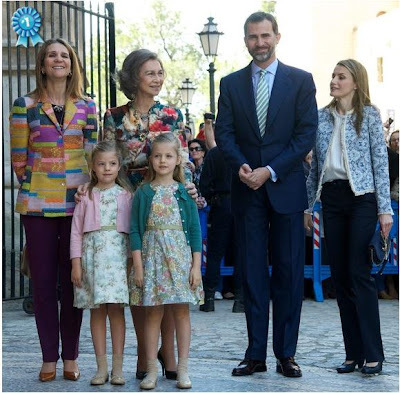 The Spanish and British royal families were out and about for Easter services, and we got some prints (!) and some color (!!) to chat about, huzzah. Look at this happy printed family, right down to Felipe's tie! And look at Elena, my oh my. Every year, I hope someone will literally dress up like an Easter egg - you know, because of giggles - and my waiting has paid off. I love that Beatrice's hat is a little yellow. I'm all for an interesting color pairing. But that coat's a bit sack-y, so this one goes to the Countess of Wessex on account of the jumpy claps. Really! That fab electric blue sculpted Roland Mouret paired with a hat leftover from Ascot (oh, I do lurve a little peacock) - Sophie, Countess of Benjamin Button Moves, just keeps getting better. This is pretty much what I'd expect from any of these three ladies, and it's all just fine. (I can't help but think that if you mushed together the better shape of Eugenie's coat with the better colors of Beatrice's outfit, you'd really be in business.) The Queen, as always, is covered on the Jewel Vault, where you can also find a flashback to Easters and Maundy Thursdays past. 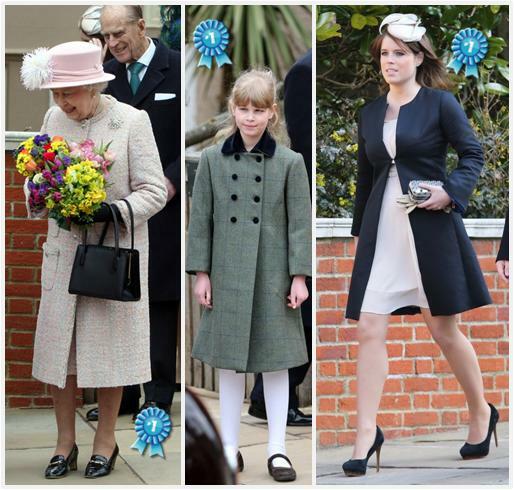 Who wins Easter, fashion-wise, for you?